Isabella, my 7 year old, is a big fan of pasta. Not just any type of pasta, though, only tomato-based ones. Before I had kids, I would always expect my future kids to only love creamy sauces with mushroom as I often see parents ordering the creamy ones in restaurants for their little ones. However, this is not to be for my kids. Being a kid with a dairy, eggs and peanut allergy, Isabella never had dairy until she was 6 years old. Before then, it was all soy milk, eggless vegan birthday cakes, sweet treats of only sorbets and fruit-based iced lollies. Thank God, she kinda grew out of it. Based on her paediatrician’s advice, we introduced dairy into her diet a little at a time and today we are happy to declare she is not dairy and egg tolerant anymore. Bring a large pot of water to boil. Generously salt the boiling water. It should taste like sea water. Add the pasta and cook until tender but slightly firm. Read the instructions on the package. I would typically undecook my pasta a little, about 2 minutes less than the specified time on the package. Check for doneness. If you prefer it a little more cooked, add another 2 minutes to the cooking time. While the pasta is cooking, heat up a wok pan or deep frying pan. No oil needs to be added as the sausages naturally have fats and we want it to cook in its own fats. Add the sausages and fry till slightly brown. Add garlic and onions, and saute till fragrant but not burnt. Add the canned tomatoes, stir to combine. Bring to a boil and reduce the heat to a simmer. Add the cherry tomatoes, salt to taste and the sugar (optional). Add the white wine. Cover and let it simmer while waiting for the pasta to be done. Check pasta for doneness. 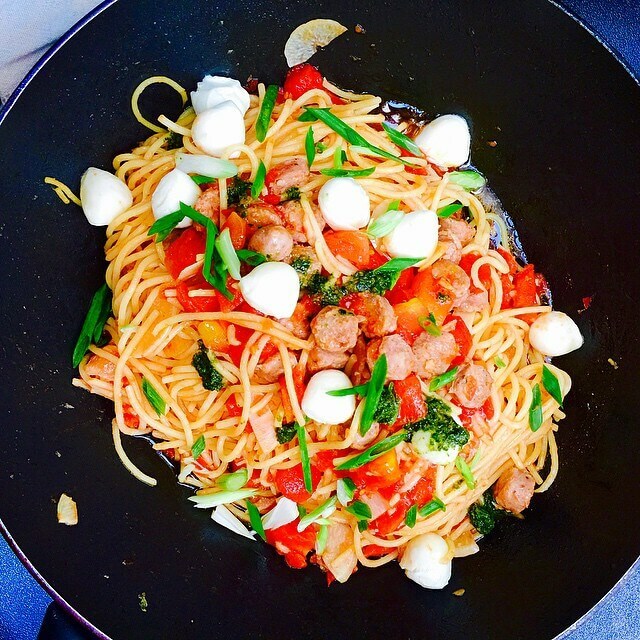 Once you are happy, use a tong and transfer the pasta to the wok pan which has the simmering pomodoro sauce. It is ok if some of the pasta water gets onto the sauce, the starchy water is actually good as it makes the sauce a little thicker.